Every once in awhile I like to share the new smartphone apps and websites that I use to make money. It isn’t big money, but a few dollars here and there really add up! I maybe put 15-20 minutes into all of this a day, and probably make around $50 a month in gift cards. I figure, that’s $50 I didn’t have, and I would have been playing on the internet anyway! It’s kind of fun now to find new websites and apps too. Here’s a list of my favorites right now! (For the smartphone apps, it might be smart to pull this up on your phone, so you can click the links directly.) Websites –Crowdtap is a new website (to me) that I just LOVE. It’s kind of fun too – it’s basically a way for companies to research their products through questionnaires, discussion panels, and samplings. I think it’s really interesting! I’ve only been doing it for about a month, and I’ve already got enough for a $10 Amazon card. Click here to sign up! –Swagbucks is just my “old faithful” in the website department. I’ve been using swagbucks the longest out of any of these, and it still pays really well. You basically just use swagbucks as a search engine to get points. You can also do special offers, put in special codes they give you on facebook/twitter/blog, and lots of other things. I even get points for printing out and using coupons from swagbucks! I have literally cashed out hundreds of dollars in Amazon money from Swagbucks since I’ve been using it. Click here to sign up! –Ebates is another “old faithful” website. This is such a neat idea. When you need to shop online, go to ebates and search for the website you’re shopping for, and see if it offers a rebate. Let’s say, for example, I wanted to shop on zulily. I would type in zulily on this site, and I see that it currently offers a 3.5% rebate! So, if I click on the link in ebates to go to zulily, it’s going to pay me back 3.5% of my purchase price. I mean seriously, the easiest way to save money shopping ever. I check ebates every single time I shop online now. Click here to sign up! Smartphone Apps–Bamboo Wallet has proven to be one of the most profitable smartphone apps for us. It’s an app that allows you to watch videos, download apps, and “like” things on Facebook for money. I just cashed out my 3rd ebay gift card from here! You can click here to download, and use the code LL731974 when prompted. –App Trailers is another one of my favorite smartphone apps. 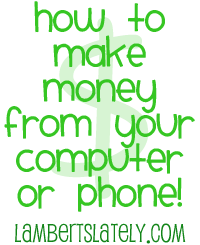 It lets you watch videos about apps and get paid…super easy! I’ve cashed out lots and lots of Amazon and Paypal gift cards from this one. Click here to download, and put in the code leslieflambert on the main page (Under “Enter Special Bonus”) for a 50 point bonus! -Shopkick just did a re-vamp on their app, and I like it! It gives you different opportunities to earn now, both from home and in stores. Click here to download. –Viggle doesn’t pay quite as much as it did when it was first launched, but it’s still easy money. Viggle is a smartphone app that allows you to check into a television program and get paid. It pays roughly a penny every 20 minutes you watch, and allows you to watch up to 12 hours a day. You also get paid extra for watching special shows, playing games, and watching videos on there. You can earn up to the equivalent of $3.00 a day on here! Click here to sign up. –Checkpoints is a fun one. It lets you scan certain items in the grocery store for points. It’s been kind of hit or miss lately…sometimes there will be a ton of things to scan, sometimes there’s very little. You just have to check! I’ve gotten several Amazon gift cards from this app. Click here to download! –Field Agent is one that Noah uses more than I do, just because he is out of the house more now. It’s an app that pays you for being a “secret shopper” at a lot of popular stores. You take a picture of a display or an item so the retailer can make sure it is set up correctly. Pretty cool! And it pays really well – usually a few dollars per job. If you’re passing by that store anyway, it’s worth it to run in for a minute or two! Click here for more info. Y’all let me know if I missed any – I love finding new ways to make a little spare change!